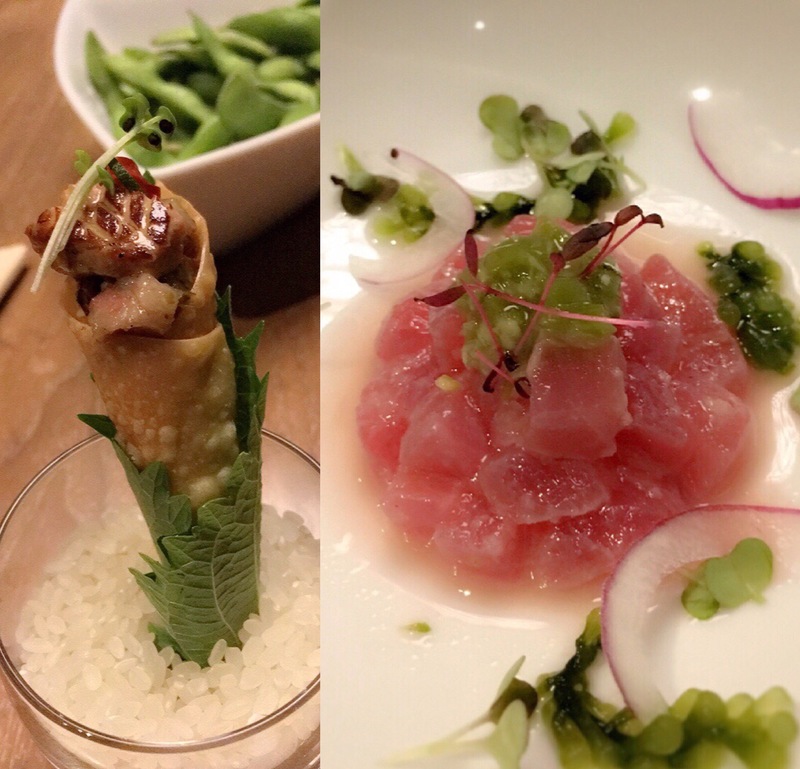 Was among the privileged last night who partook of a special omakase dinner created and prepared by Nobu New York’s Chef de Cuisine Ricky Estrellado (proudly Pinoy) and Nobu Manila’s Chef de Cuisine Michael de Jesus (also proudly Pinoy). 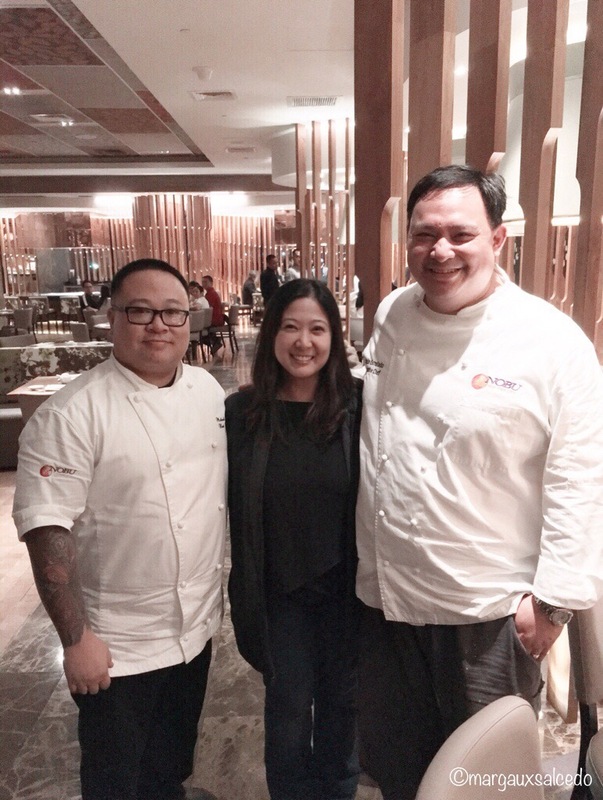 Chef Ricky Estrellado (on the right in the photo above, dwarfing me and Chef Michael de Jesus) has been with Nobu New York for almost 10 years. He also oversees Nobu Next Door, which he helped open way back in 1998. He also helped open Nobu Las Vegas in 1999. Because both chefs are Filipino, the theme for the evening was Filipino food but given a Nobu twist. Unfortunately the dinner was for two nights only. But I am praying that Nobu will keep the menu, even for a couple of months. I strongly recommend that every chef who wants to learn about Filipino food try this menu! It just shows the limitless possibilities of how to execute Filipino cuisine. And while others massacre it with deconstructed versions and pairings that don’t really fly, this menu hits the nail on the head and the ball out of the park. Dinner started with an impressive zensai (a bite-size snack appreciated over beer or sake): a combination of sisig and an eensy cube of foie gras. We were told to have it all in one bite, the surprise being the accent of the shiso leaf, whose slight bitterness very calculatedly broke the fatty flavors of the sisig and foie. This was followed by the (recently overly-celebrated) kinilaw. I am still partial to Enting’s Kinilaw but this was pretty good. You can’t go wrong with great ingredients. The next three dishes were the most impressive. The third dish presented the chef’s take on the traditional lumpiang ubod (fresh spring roll). The chefs replaced the spring roll wrapper with a light and fluffy crepe, giving it a very cosmopolitan look and feel. But what made me perk up were the small slices of Lapu Lapu on the side. This had a very smokey accent to it that was unforgettable. Next was yellowtail sashimi. It was unbelievably (believe it!) topped with bagoong (shrimp paste)!!! Yet it remained delicate and fresh. To counter the saltiness of the bagoong, another brilliant accent for balance: a Japanese mountain peach called Momokochan, usually used as a palate cleanser, was provided for a just whisper of sour (not a sour whisper!). My favorite dish of the night was this next one: a lobster sinigang! The chef used a spiny lobster, as opposed to a claw-y lobster, preferred for its light meat. And for the soup, the chef used tamarind. So it’s the Nobu version of sinampalukan. This is by far the best fancy sinigang I have ever tried!! 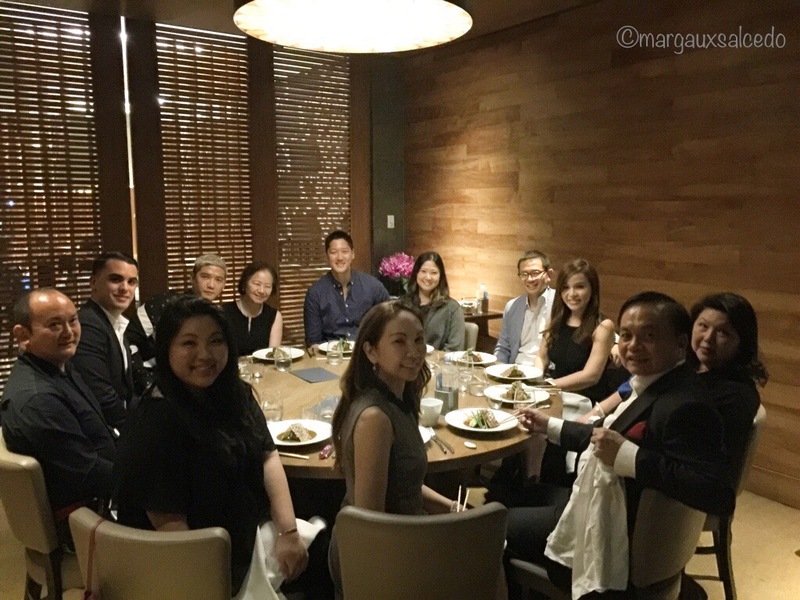 At this point our table of very candid diners started joking that Nobu is where you eat but need to go for another meal after because the servings are degustation-style. Boy did we eat our words because the next three dishes stuffed us silly! Two hefty slabs of sous vide pork were served as Nobu’s version of “crispy pata“. Not as crisp as we know it to be but with fat that did stick to your teeth. This was paired with laing, the only pairing in the entire menu that I didn’t agree with – because a Filipino’s gut just needs rice with his crispy pata, hehe! Next up was the chef’s version of Kare Kare. They used beef short ribs instead of oxtail and this lay on a bed of peanut sauce, as we know kare kare to be served. But for the Nobu twist, it also came with a cracker made of Peruvian chili sauce (anticucho), which you could easily mistake for bagoong. Nobu should put these in packs and sell them, haha. Then came our big karma: while we kept asking for rice, unbeknownst to us, we were in for a LOT of rice in the end — a Pinoy sushi platter!! Now the concept isn’t new. I have been to other restaurants that have “Filipinized” sushi. But none have captured it as they did at this omakase in Nobu. The chefs presented Gen San tuna topped with gata (coconut milk). This was followed by Yellow Tail or Salay Salay with the delightful sourness of paksiw. Tachi-uo or belt fish was topped with salted egg. Mackarel or shima aji was cooked tinapa style. And there was even an adobo of dapa or flat fish. For fun, I think the chef also threw in something that reminded Anna Sobrepeña of suman (after which everyone gushed, “I loooove suman!! !”): garlic rice made crispy. Everything was executed excellently. For the finale, (sorry ang laki ng video below – I don’t know how to downsize it!!!) we were served this uber amazing Nobu version of the quintessential Filipino summer dessert, the Halo Halo. A good halo halo is distinguished by the quality of the shaved ice – which is why Razon’s is so popular, even if it does not have a lot of “sahog”. Nobu’s halo halo goes another level. First, they use coconut milk instead of water for the crushed ice, eliminating the need to pour in milk, and also using coconut milk instead of evaporated milk, so it’s not so heavy. The layer of ice is also really thick, camouflaging layer after layer of delight: ube gelato, yuzu gelatin, macha bits, beans. I dare say, this can give Milky Way a run for its money. Reservations recommended. 02 691 2882. Wheelchair accessible (but the walk from the hotel entrance to the restaurant is a bit of a distance). I love reading your articles. I love how you write.